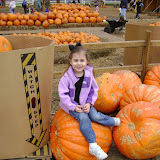 Recently we went to Carmichael's pumpkin patch. We have to go every year--it's a tradition to get pictures on all the pumpkins now! Well of course we chose a very windy and cold day, so for a lot of the pictures the girls had their jackets on! Also since we have Bailey this year, but she cannot stand up on her own yet, Avery was trying to hold on to her most of the time. It was hilarious! I don't think we had any pictures where both girls were looking at the camera at the same time and smiling. Oh well. They're cute anyway. There were so many funny ones I did a separate slideshow of the "outtakes" so enjoy! OK watch this first one and think, "Oh, what cute girls! 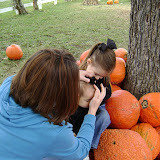 They had such a fun time at the pumpkin patch!" I was cracking up looking through those outtake pictures. Ha ha! The girls looked so cute in their black shirts and bows and I think you got several good ones in that first slideshow. Such sweet girls. We can't wait to see y'all in a few weeks!! Cute anyways. I love Bailey's sweater. I really like the candid pics too. It's important to remember that everything wasn't perfect.